What’s that black toothpaste everyone is using? Maybe you’ve noticed – charcoal is everywhere. Charcoal face masks, charcoal teeth whitening, charcoal toothpastes, and charcoal supplements are blowing up our social media news feeds. It’s a dramatic look to see a smile smeared in what looks like black dirt. But is charcoal toothpaste safe? Does it work? Or is it just a marketing gimmick? If you’re wondering whether or not charcoal toothpaste is good for your teeth – I want to applaud you for questioning anything the crops up and gains popularity so quickly. Let’s take a discerning look at this internet sensation. Activated charcoal is known for its detoxifying powers. It’s so powerful that hospitals use it to treat patients who’ve been poisoned. It is considered to be more powerful than stomach pumping in most cases. The charcoal binds to chemicals and prevents the harmful substance from being absorbed by the stomach. I personally use it after food poisoning episodes. But activated charcoal isn’t the same stuff that’s in your 4th of July barbecue. Also called activated carbon, activated charcoal is created in a high heat process using materials such as coconut shells or other sources. The end product has millions of tiny pores – these tiny pores are what traps the toxins and chemicals. Activated charcoal works by trapping unwanted materials, toxins, and chemicals within its pores and then it’s flushed away. This process is called adsorption. Not to be confused with absorption whereby chemicals are soaked up by a substance. Activated charcoal works through elements binding to the surface, which is ADsorption. Additionally, activated charcoal is negatively charged and so lots of substances with positive charges bind to it – including free radicals, toxins, gases, and chemicals. Activated charcoal is known for cleansing skin, whitening teeth, and even preventing hangovers – but as this abundant use of charcoal grows we need to be wary of sources and the potential for overuse. You should also keep in mind that consuming activated charcoal with medication can render the drug useless. Eroding enamel – This is my #1 concern for activated charcoal. The abrasiveness of most charcoal products is almost the equivalent of grating sand across your enamel and if that doesn’t make you shudder – it should! If your charcoal toothpaste is too abrasive, it could wear down your enamel and cause permanent damage to your teeth over time. This is why the type of toothpaste is critical. I’m worried that after this wave of charcoal toothpaste mania we will see patients showing up to dentists’ offices with damaged enamel and tooth decay. I don’t mean to be an alarmist – It’s a real concern. Be careful when choosing charcoal toothpaste. And if you think it feels too gritty, it probably is – throw it out. You can check the Relative Dentin Abrasivity (RDA) of your charcoal toothpaste by doing a quick online search. If you can’t find the RDA, then I don’t recommend taking the risk. Charcoal toothpaste source – This is another important factor to consider when shopping for charcoal toothpaste. Because it’s a relative newcomer in the world of dental care, charcoal toothpaste doesn’t really have any established brand (not that we’d want to see a Crest version). This means that you need to be extra careful where the material to make the charcoal in your toothpaste is coming from. I’d make sure your toothpaste is made in the United States, and that it explicitly tells you what the source of the charcoal is, for example. Coconut shells are a common source – try and stick with toothpaste that meet both those criteria. Again, due to its new place on center stage there could be some counterfeit toothpastes out there. We’ve seen toxic toothpaste from China make its way into U.S. supermarkets before, it’s always a possibility it can happen again. Believing it’s ‘whitening’ – There’s no conclusive evidence that shows charcoal toothpaste whitens teeth. It does help remove stains but this isn’t the same as whitening teeth. Teeth whitening happens on a deeper level and charcoal toothpaste doesn’t stay on the teeth long enough to whiten them. If you’re looking for Hollywood-style results, then charcoal toothpaste might disappoint you. However, the stain removing results of charcoal toothpaste are usually fine for most people. I prefer to offer realistic expectations in a world of sensational claims. 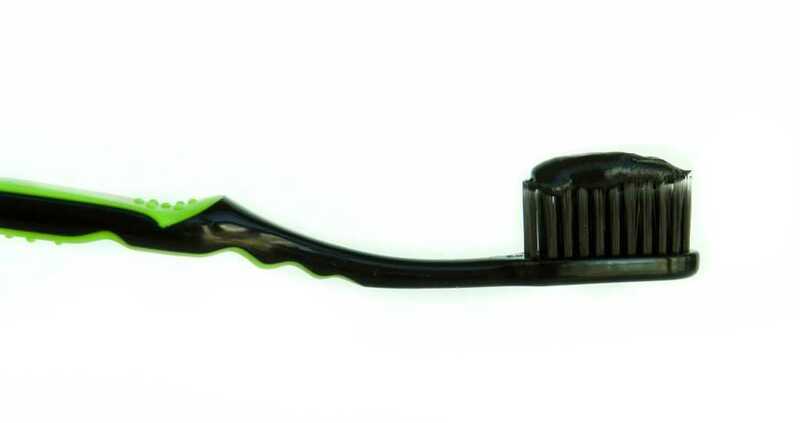 Now to the benefits of charcoal toothpaste, and there are some great ones! Removes stains – If you’re a coffee, tea or red wine drinker, charcoal toothpaste could be a great fit for you. Charcoal toothpaste is effective at removing surface stains. At this point you might be wondering… what’s the difference between stain removal and teeth whitening? Surfaces stains are called extrinsic stains, while deeper stains come from within the tooth are called intrinsic stains. Intrinsic stains are caused by: fluoride, damage, weak enamel, medication, and anything that affects the tooth from within. Extrinsic stains are caused by all the typical culprits: coffee, tea, red wine, tobacco, berries, other staining foods. Charcoal toothpaste is great for some extrinsic staining. Removes acidic plaque and improves halitosis – Charcoal toothpaste raises the pH of your mouth and can help reduce the buildup of acidic plaque and improve your breath. Keeping a balance in your oral microbiome is important to maintaining good dental health and overall health. I’m hoping your charcoal toothpaste will help in promoting balance in your oral microbiome and prevent damage by avoiding microbe-killing substances. This means (hopefully) a toothpaste free of sodium lauryl sulfate (SLS), no artificial sweeteners, no fluoride. It would be even better if it was also free of the antibacterial essential oils such as peppermint – remember it’s all about progress and not perfection.